This article first appeared on East Niagara Post on February 17, 2015. It is repeated here as I work to put all my book reviews in one place. They will be posted on Thursdays or Fridays and only be altered from the original in that I will add publisher information and pages. Hopefully, by revisiting these reviews, other people might find a book they'd like to pick up for their own enjoyment. The Forgotten Girl by David Bell is a thriller disguised as a mystery. At least I found this book in the mystery section of the New Fiction at the Lockport Library. In all honesty this is a thriller, that while it might not scare you, will keep you on the edge of your seat waiting for the next shoe to drop. Jason Danver and his wife, Nora, have returned to his hometown in Ohio after losing his job in New York. Neither one is exactly ecstatic about the move, but it should only be until they get back on their feet. For Jason, the return reopens memories that he thought he had left behind long ago. We’re introduced to Jason through a flashback where he is being questioned over the disappearance of his best friend, Logan. It happened the night of their high school graduation. Logan and Jason argued after Logan attempted to sweep Jason’s girlfriend, Regan, away from him. Jason hits Logan, knocking him to the ground. Stunned, Logan glares at his friend and disappears into the darkness of the forest. It’s the last anyone ever sees him. Shortly afterwards, Jason leaves Ohio for college, hoping to never look back. Jason’s appearance in town twenty-five years later reopens wounds with some of the town people over Logan. At the same time, Logan’s elderly father is dying and wishes to see his son one last time before he dies. He uses every means necessary to bring this about, including sending an old friend to pump Jason for any iota of evidence on the whereabouts of the lost boy. Jason, however, has nothing new to say. A few days later, Jason’s drug addled sister, Hayden, and her teenage daughter, Sierrra, show up at the front door. Hayden is thrusting her daughter on Jason and Nora as she goes off for a couple days to take care of some business. The childless couple are somewhat confused by the actions of a rebellious teen. It’s a crash course in parenting. When Hayden disappears for longer than expected and her car is found abandoned near the site of Logan’s disappearance, Jason fears the worst for the safety of his safety. Considering his involvement with Logan nearly three decades before, Jason is once again a suspect. It is at this point that Jason finally does some digging himself. Is Hayden’s disappearance somehow connected to that of Logan Shaw? Where is Logan? There were stories that Mr. Shaw received cards from his missing son throughout the years. Was he still alive somewhere? Could Jason find him, or was there something far more sinister at play? When the smoke clears after all the twists and turns, you’re left there wondering how the characters arrived at that point, and how a plan so diabolical managed to stay secret for twenty-five years. You also wonder how a group of characters who end up doing the right thing can possibly be so unlikable. At the beginning of this novel, you want to like Jason and maybe feel a little sorry for him after all he’s been through. Yet, as the story unfolds, his actions take him out of the sympathy pool. Poor Regan, his ex-girlfriend. Her character never really develops and what we’re given is an indecisive, unfriendly woman whose character should have had a larger role in the novel. Hayden could have been a fun character with great exploration given to her tragic life. This novel is heavy on dialogue, both between people and the inner dialogue with most of the characters. Generally, this is not my favorite style of novel writing. While character development is always key to a good book in my opinion, a good descriptive setting is also very important. Oftentimes, heavy dialogue detracts from the building of the story. In this case, Bell does a fantastic job of delivering both dialogue and setting. Bell’s dialogue flows naturally, with each character having his or her own distinctive voice. It’s almost as if he recorded actual conversations with people and transcribed them into his novel. It is very enjoyable and easy to read. It took only two evenings to finish this book, upon which I checked to see if the library system had anymore of David Bell’s books. One of the things I really liked about this book was Bell’s ability to darken the setting as the plot darkened. As plot events become more dire for Jason and Hayden, their actions become more frenzied. All this action contributes to an engaging story for the readers. Through every step Jason takes, we’re transported into his past along with him. This book was a lot of fun to read. 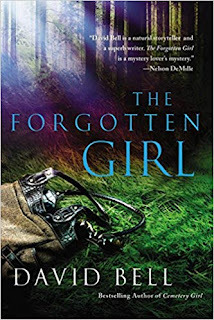 Craig Bacon doesn’t have any bodies hidden in the forest….Or does he? You can follow him on Twitter at @craigbacon1973.